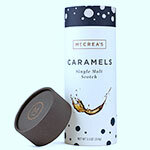 McCrea's handcrafted Black Lava Sea Salt vanilla caramels are spiked with just the right amount of big crystals of Hawaiian Black Lava Sea Salt. All natural, no chemicals, no corn syrup, no compromise. Striking appearance, flavor, and crunch. Made in Boston, Massachusetts.